I’m not a fine artist. I definitely fall into the graphic designer category, although there are more similarities than differences between the two titles. Fine art is graphic design with vague intentions. It often leaves the viewer scratching their head. My creation process, and the creations themselves, are usually logical and straightforward. Regardless, I like to dabble in art—a lot. 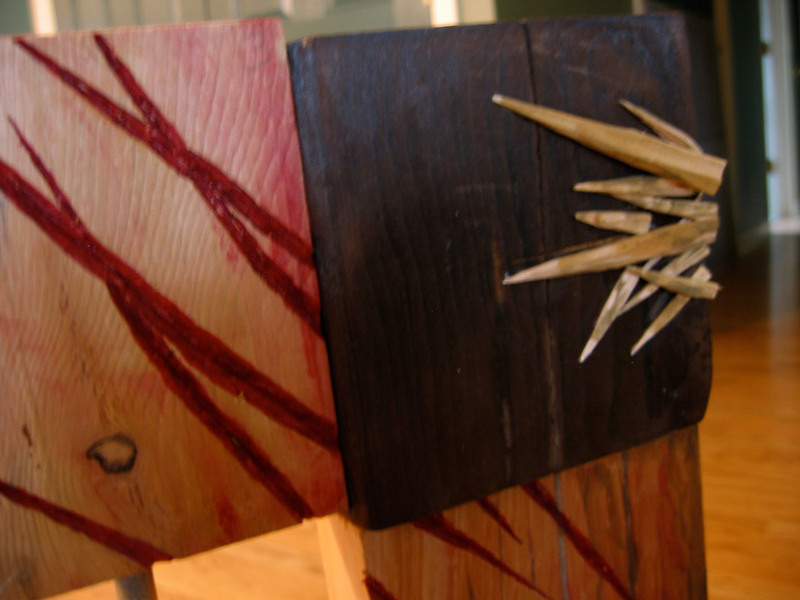 And when I find myself dabbling in the finer arts, I find myself using wood as the primary medium. Wood is cheap. So am I. It’s a partnership with which I’m comfortable. There is a small woods adjoining my property and it has proven to be an amazing natural resource for artistic endeavors, both for me and for my wife. But for me, wood goes back to my childhood. The smell of sawdust is the smell of my father. He has been climbing and cutting down trees as his profession since before I was born. The drafty farm house in which I grew up was heated with wood. My home today is heated with wood. During winter months I enjoy waking up at 3:00 am, shuffling outside to the wood pile and gathering fuel for the remainder of the night. I learned to create woodblock prints in college. It’s one of the few art methods I practiced in any capacity after graduating that didn’t involve a computer. 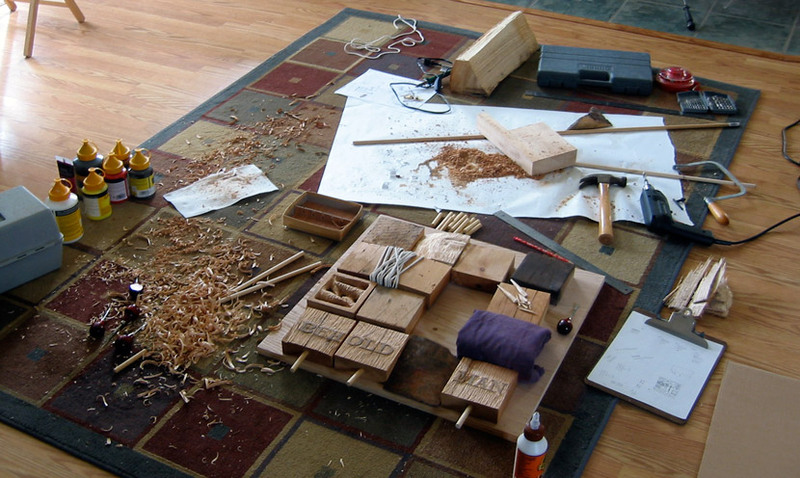 That was the extent of my woodwork until a few years ago when I bought a basic wood burning kit. 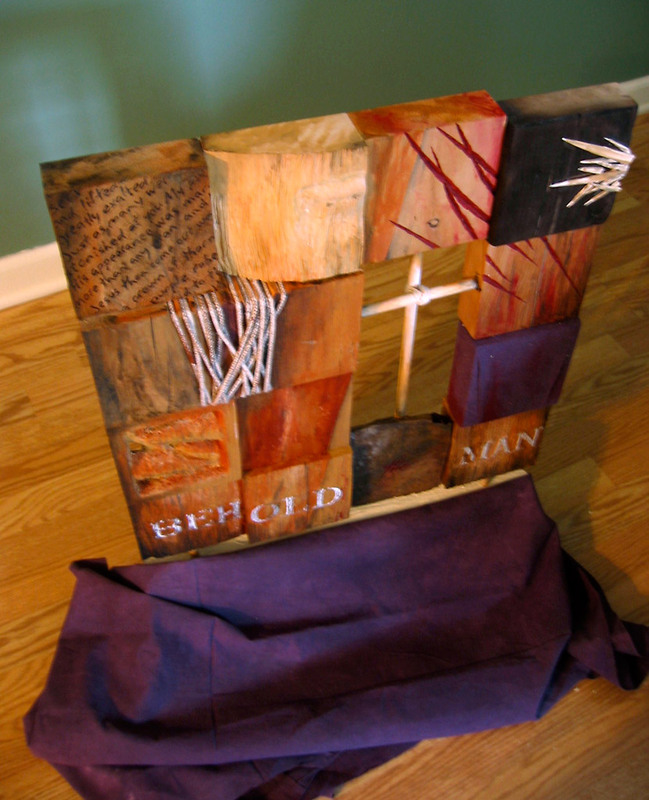 Using that, I created a few gifts for family and one large-scale piece for a church event. 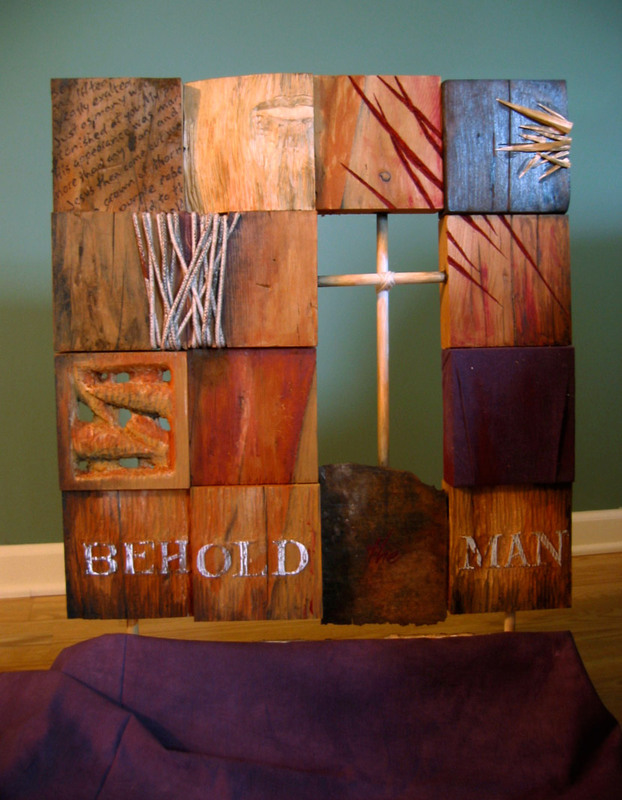 But to date, my favorite “fine art” piece that I’ve created is a mixed media sculpture that uses a vertically-standing 4×4 grid of wood blocks as its basis. 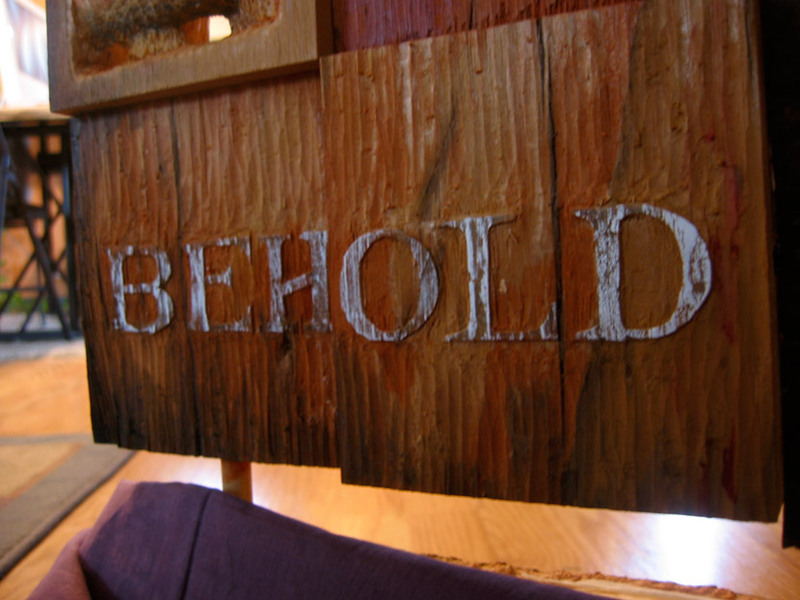 It contains some carved elements, some gluing, some wood burning and some plain old burning. The blocks were slices of a porch post. I got them from my neighbor, Ben. (The wallet does open occasionally.) He has a couple barns and some smaller buildings full of old furnishings, scraps and architectural pieces. This was the first time I met Ben. I tried explaining what I was looking to do. I’m not sure he understood, but he did end up telling me all about our other neighbors, told me about a possible future block party and invited me to his church. I collected $27 worth of wood scraps. Ben wouldn’t take my money. He told me it’s on the house as a “welcome to the neighborhood” gift. In my experience, the best art projects take over the house. Lacking a true wood shop, the living room air was soon filled with sawdust. The piece was for an event called Scarlet Steps. This was the second year my church held this Good Friday interactive exhibit (more on this event in a future post). My original goal was to peg the blocks together, allowing space between each one. That proved too unstable. I ended up gluing all the blocks together, staggering their depths. That gave the structure a sense (and a reality) of strength, while allowing a more natural feel. Each block panel featured something different. 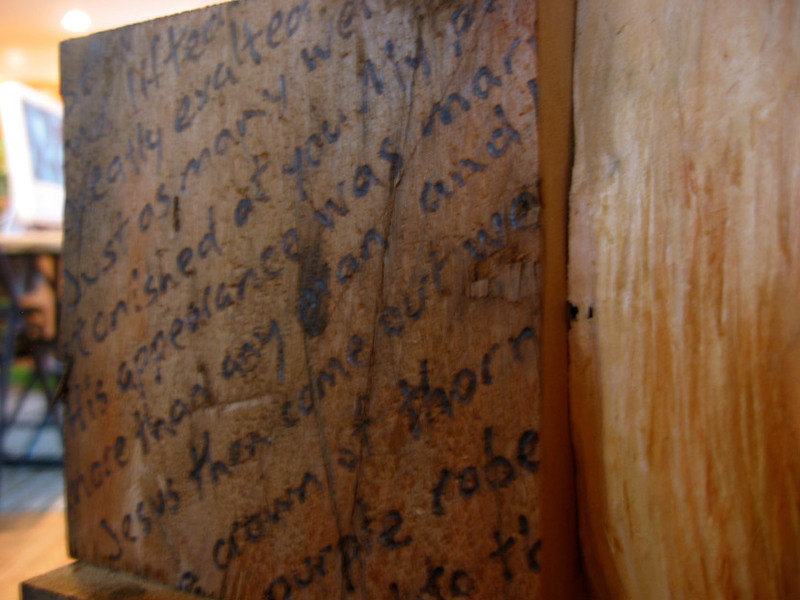 One was wrapped in purple cloth, representing Christ’s robe. One had thorn-type shapes carved into it. One piece was thrown into the wood stove for a couple minutes, then sanded down to remove all ash and debris. Two of the interior blocks were left out and a cross shape took their place. The block it rested on was from the woodpile, rather than from a porch post. The base of the entire piece was also from the woodpile and was shaped with an axe. I was very pleased with the final piece. Aesthetically, it was appealing. The concept was relatively straightforward, despite the compilation of various images. It told a story—the story of a perfect King’s sacrifice for His rebellious creation. The process was enjoyable. And as a result, I got to know a neighbor. I went back and showed Ben my creation. He was confused. Maybe I am a fine artist.